Just as he had the game of baseball, “Mr. Cub®” Ernie Banks approached life after baseball with his trademark enthusiasm and commitment to being the best. And, just as he had during his 11-year playing career, Banks has remained loyal and actively involved with the Chicago Cubs for more than 54 years. His remarkable love for Chicago fans and longevity within the Cubs’ organization place him among a select group of legendary men who spent 50 years or more representing a single MLB team in one way or another, such as: Stan Musial, Tommy Lasorda, Brooks Robins, Al Kaline and Johnny Pesky. Ernie Banks is a living, breathing part of The Chicago Cubs past, present and future..just as Tommy Lasorda is - to many people – the L.A. Dodgers. “Mr. Cub®” Ernie Banks in Tuzla, Bosnia. After retiring as a player on December 1, 1971, Banks became the first player in Cubs history to have his number retired. The Cubs signed him as a coach and on May 8, 1973, Cubs manager Whitey Lockman was ejected from the game. Coach Ernie Banks filled in as manager for the two innings of the 12-inning 3-2 win over the San Diego Padres. Thus, he was technically, if not officially, MLB's first black manager, predating Frank Robinson's hiring by almost two years. In 1977, Banks was elected into the Baseball Hall of Fame in Cooperstown. Chicago fans will always remember him as the ballplayer who said, "What a great day for baseball! Let's Play Two®!" He will always be "Mr. Cub®," the most popular player the team ever had. “Mr. 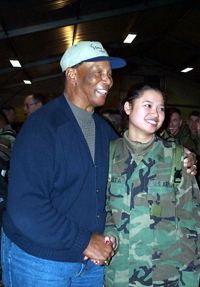 Cub®” Ernie Banks poses Dec. 19, 2000, with an Army sergeant at Task Force Eagle headquarters in Tuzla, Bosnia (right). At each stop on the defense secretary's holiday tour, Banks told service members they are playing on the best "team" in the world. In December 2000, Banks was one of a star spangled contingent that took part in U.S. Defense Secretary William S. Cohen's annual holiday USO tour visited Europe. Banks was joined by NFL Hall of Famers Mike Singletary and Terry Bradshaw, members of the Dallas Cowboys Cheerleaders, comedian Al Franken, and singing stars Carol King, Ruth Pointer-Sayles, Jewel and Shane Minor.